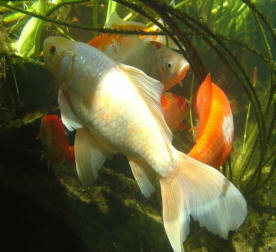 Would you like to get pictures like these of your own pond? Record your pets’ markings for posterity? Or just visit their world? Aquariums are fragile, so be careful when assembling your photography rig. 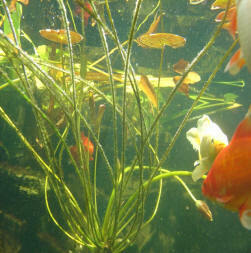 First, place the empty aquarium in your pond, and then carefully load the ballast sufficiently that the aquarium sinks about halfway down. 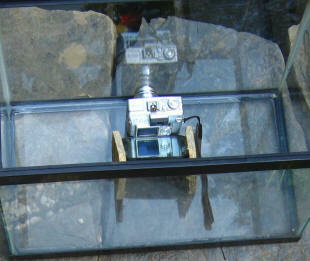 The aim is to have the aquarium low enough under water that the camera will be below the waterline, but the top of the aquarium remains high enough above the waterline that the camera stays dry. 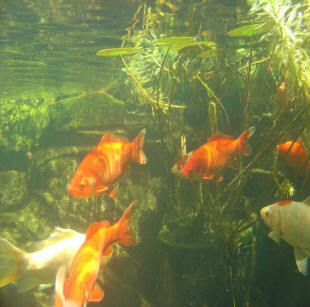 With the aquarium adequately ballasted, put the camera in the aquarium with the lens flat against the glass. You can use many different things for ballast; I used pavers (patio bricks) but bags containing sand, stone, or pea gravel would do the job. Be sure to bag whatever you use. 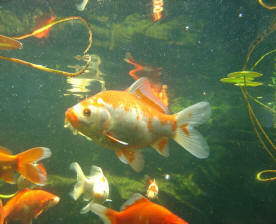 Use several bags for ease of loading and adjusting, and keep the bags clean, so you don’t scratch your aquarium. The amount of ballast you need depends on the size of your aquarium. Water weighs 8.34 lb per gallon (1 kg per litre) so if you know the capacity of your aquarium, you can estimate how much ballast you’ll need to sink it. In other words, a 10-gallon aquarium will need about 83 lb of ballast to sink completely, but we only want our aquarium to sink halfway, so about half that amount of ballast should do the job. Obviously you should practice this without the camera! 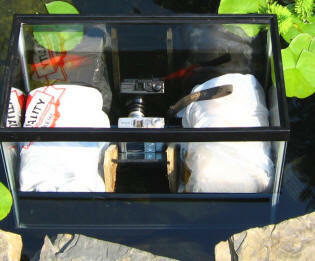 Aim to get the tank floating high enough for safety so that your camera doesn’t get wet if water splashes about. Move the ballast about in the tank so that it is evenly distributed; this will make it easier to keep the rig steady and to tilt it up or down slightly when required. When you’re finished, carefully reverse the procedure to remove the tank from the water: take out the camera first, then the ballast; and the empty tank last of all. Light causes a variety of problems. Ambient light can makes it difficult to see the viewfinder display at the back of the camera. You could fabricate a shield for your viewfinder, or move the mirror about a bit so that it catches less light. But may I suggest you keep it simple? Just shoot. At least with digital cameras, that’s best. Shoot a lot. Fill your memory, dump it onto another media, and shoot some more. Sooner or later you’ll get good images worth keeping, and the rest you can throw away. On the other hand, if there isn’t enough natural light your photographs will be too dim. You’ll get the best results at midday, when the overhead light is strongest. 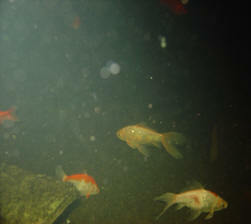 You can also get good shots at night as well if your water is very clear and you have underwater floodlights. 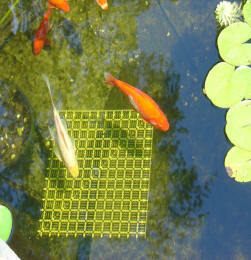 Suspended matter in the water will be catch and scatter the light from the flash. 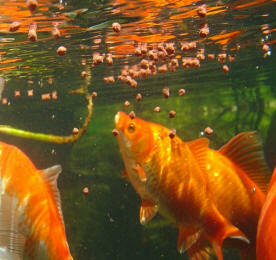 For best results, wait for the water to cool and the fish to quiet before using the flash. The same applies to long exposures, where suspended matter will streak across the image in a very annoying way. One last word (okay, six): Wait until you see your movies! Who needs to go diving on a reef to see beautiful fish in their natural habitat?